Howie is a male manatee and has been returning to Blue Spring State Park’s warm spring waters every winter since he was first identified in 1971. He is one of the most popular manatees at the park, and he has developed a reputation for being playful and a bit of a mischief-maker. A photo of Howie from January 23, 2019 on one of his recent visits to Blue Spring State Park. Like most manatees living in the wild, Howie can be identified by his scars, which are mainly located on his paddle-shaped tail. He is a favorite of Wayne Hartley, Save the Manatee Club’s Manatee Specialist, who tracks his return to Blue Spring each winter, along with Cora Berchem, Save the Manatee Club’s Manatee Research & Multimedia Specialist. Howie is usually one of the first manatees to show up for the season, and he is often one of the last to leave. Like the scamp that he is, Howie sometime arrives at the park just after Wayne and Cora have finished taking “manatee roll call” in the morning. 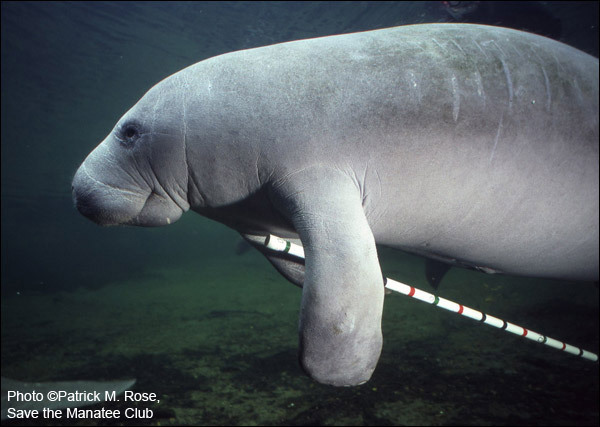 In this photo, Howie “helps” Tom O’Shea and Patrick Rose, Save the Manatee Club Executive Director, as they use a measuring stick to determine his size during manatee research work at Blue Spring State Park. In the last few years, Howie has been following his usual pattern of coming to Blue Spring in late November or early December, and he frequently stays through March. In the winter, he can often be found in the swim area of the park, which is off limits to humans when the manatees are visiting. During the 2017 – 2018 season, Howie was part of a group of males chasing a female named Lemon around the spring run. Five years earlier, he was also part of a group of 10 male manatees reported in a ditch behind the Central Florida Regional Hospital in Sanford, Florida. Howie and the other males had ended up there after pursuing a lovely young female named Pine. The hospital is located on the banks of Lake Monroe, a waterway that is connected to the St. Johns River. Fortunately, all was okay, and the manatees were able to get out. Eventually, they left and returned to Lake Monroe, and Howie and the others were none the worse for their experience. 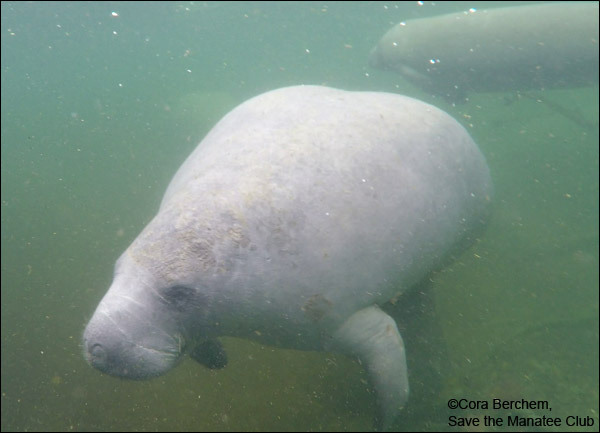 Be sure to check our Blue Spring webcams and get Wayne’s Manatee Updates for the latest news on Howie and other Blue Spring manatees, and click the “Learn More” box to see scar charts for Howie and the other Blue Spring manatees. Plus, see video of Howie below and check out our YouTube page for additional videos. If you are interested in finding out more about manatee mating habits, click here to learn about manatee birth and reproduction. You can also adopt Howie or other manatees. For more information, go to Save the Manatee Club’s Adopt-A-Manatee page, or call 1-800-432-JOIN (5646). Watch video of Howie on his various visits to the warm waters of Blue Spring State Park in the winter. See if you can spot the scars on his tail that help identify him.